After more than three decades of bearing more than a passing resemblance to refrigerators on wheels, the appearance of North America’s largest transit bus fleet is undergoing a stunning transformation, with an eye-catching new look and the introduction of 21st century amenities designed to brighten the day and ease the commutes of harried customers. The first seven in an order of 75 new MTA buses, fresh off the assembly line were introduced by Gov. Andrew M. Cuomo; MTA Chairman/CEO Thomas F. Prendergast; NYC Transit President Veronique “Ronnie” Hakim; and Darryl Irick, President of MTA Bus/Sr. VP, NYC Transit Department of Buses. Wrapped in two shades of blue with sweeping gold accents, the handsome, new buses are hitting the streets in the borough of Queens. The 60-foot, low-floor New Flyer Xcelsiors are part of a series of upcoming deliveries over the next five years, totaling more than 2,000 new, state-of-the-art vehicles. They will help ease overcrowding, improve dependability and serve to modernize more than one-third of the MTA’s bus fleet. In a nod to the widespread use of electronic devices today, these buses feature Wi-Fi service and USB charging ports, which allow riders to communicate and top off device batteries enroute. The first seven buses are already in service while the remainder of the order is being delivered at a rate of four to five per day. All 75 buses will be in service this summer and operating in the Richmond Hill, South Jamaica, South Ozone Park, Springfield Gardens, Rosedale and Far Rockaway neighborhoods in Queens. The buses were introduced at a ceremony held at the New York City Transit’s Michael J. Quill Depot on Manhattan’s far West Side. Gov. Cuomo and Chairman Prendergast also took the opportunity to announce the successful field test for MTA eTix, a free app that will allow Long Island Rail Road and Metro-North commuter rail customers to purchase train tickets anytime, anywhere on their mobile devices, instead of using paper tickets. 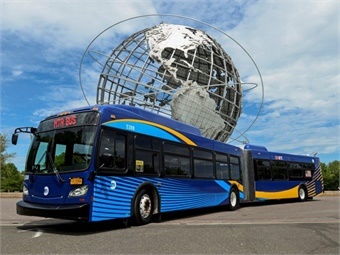 “We see the debut of these new buses and the roll out of the MTA eTix field test as important steps forward as we continue to renew, expand the transit system and create an enhanced experience for our customers,” said Chairman Prendergast. All new bus deliveries will be given the new paint scheme and upgraded customer amenities.